In a deserted place in Iran there is a not very tall stone tower that has neither door nor window. In the only room (with a dirt floor and shaped like a circle) there is a wooden table and a bench. In that circular cell, a man who looks like me is writing in letters I cannot understand a long poem about a man who in another circular cell is writing a poem about a man who in another circular cell… The process never ends and no one will be able to read what the prisoners write. In this shortest of short stories, the scene depicted by Borges is at once evocative of vast imaginations and a description of mathematical infinities. The setting, for those in the West, conjures up the exoticism of Oriental lands, whilst the windowless spaces where each man resides look inwards in a sort of self-reflection. With a remarkable economy of means, Borges touches upon the limits of language and brings together improvisation with endless repetition, the former flowing through the unreadable letters, and the latter found in the way that the image of the narrator in the pondering poet is infinitely mirrored… The circular tower is a fragment of a much larger circularity, echoed in a universe of parallels and paradox, where invention finds its roots in mathematic theory and each fragment exists as a description of an incomprehensible whole. All of this can equally be said of the work of the artist Timo Nasseri. Born in Berlin, Germany, in 1972, the son of a German mother and an Iranian father, Nasseri grew up absorbing the influences of two radically different cultures. He describes the Western, Germanic sensibility as rational and logical, whilst stories from his father were imbued with fantasy, imagination, and possibility. In visual terms it may be surprising for Westerners to think of the highly structured art and architecture of the Islamic world as a realm of imagination, and this misunderstanding, these gaps in comprehension, became a drive for the artist in exploring the visual world that emerges when East and West meet. Having been given a camera at the age of eight, Nasseri developed an enthusiasm for taking pictures, for looking at the world, which later led to his training as a commercial photographer. During this time the realization came that photography need not only be used towards superficial ends, but could carry much deeper meanings; and soon he began to use his skills to communicate larger ideas. This expanded further into a sculptural practice. Nasseri describes how his imagination was sparked by a flag waving in the wind—suddenly he saw the possibility of transforming a two-dimensional image into a three-dimensional form.ii This was a defining moment for the artist; since then he thinks about creating art works rather than, as a photographer does, capturing something that already exists. By constructing drawings and sculpture Nasseri invents; he generates forms and images through a process which is a synthesis of reason, intuition and imagination. The work he has produced over the past fifteen years spans a variety of mediums and methods, yet individual works are immediately recognizable as part of his larger practice. With many of the works, the influence of Islamic art, its mathematics and philosophy, makes the most striking first impression. However Nasseri’s geometries are not appropriated, but are instead the result of a keen desire for comprehension. The most complex works are the result of years dedicated to understanding how the mesmerising architectural geometries he encountered on his travels along the Silk Road are constructed. Beginning with the simplest of elements, every step of the process is one that the artist himself has calculated. This is most evident in his works inspired by muqarnas: geometric ceiling vaults that originated in Iran and appear widely in Islamic architecture with their honeycomb-like structure. The first question that arises is what it means for an artist brought up in Germany to work with this ancient Islamic visual language. The German art historian Hans Belting, who has been a significant influence on Nasseri, explores the meeting of these two visual histories in his book Florence and Bagdad: Renaissance Art and Arab Science.iii He throws some light on the misunderstandings that occur between two cultures whose approaches to the construction of meaning are fundamentally different. Whereas in the West images are understood through the depiction of the figure, and a perspective that is constructed to direct our eyes out into the world, Islamic art is one of pure abstraction, which turns us inwards towards a world that is invisible. Western perspective fixes the gaze within narrative imagery, while this non-pictorial language renders a perceptual experience through mathematics and light, which shifts and oscillates before our eyes, describing cosmic motions both far larger then the self and reflected within us. Entering a room hosting Timo Nasseri’s works is to encounter a fusion of these two histories; dazzling mathematical abstractions meet the eye-line of Western perspective, with pieces hung on walls or placed on plinths in a manner conventional to Western exhibition-making. The works have a perceptual power, and the placements allow us to traverse the space in a way that reveals the spatial dynamics between them, as well as the mesmerising instability of Nasseri’s mirrored muquarnas. One does not have to dig too deeply before the questions of perspectival and perceptual histories are overtaken by the philosophical differences between the two cultures. For many in the West, these (though stunningly beautiful) geometries have been read as “mere” ornament: a vast gap in understanding of a language which explores deep infinities, where each fragment is a description of the whole, and each self contains the universe. In his own quiet way, by translating ancient forms into a contemporary practice, Nasseri is opening a door for us, giving us a glimpse of the hidden spaces behind. There is a double concept in Islam, that of Zahir and Batin. Zahir describes what first meets the eye, the surface or apparent meaning, which hides the Batin: an internal space that cannot be seen from the outside, much like Borges’ description of the tower with neither doors nor windows. Sufis would describe each individual as having a Batin: an inward self. This duality describes the nature of Islamic art, its contemplative nature being an opening for inner reflection, whilst its ornamental nature also hides a deeper meaning that is inaccessible to the uninitiated. What lies between the surface and its interior is a zone of interpretation. The idea of hidden knowledge, of an inaccessible core that defies translation or notation, is recurrent in Nasseri’s artworks, though revealed through ceaseless and transparent attempts at understanding. The artist describes a sense of circling, in both making and thinking about the works; “circling around without getting to the point, but getting to a different point.”iv He articulates this in the title of the drawings One and One (2008–current), which form the basis of the later three-dimensional works, retitled from Muquarnas to Epistrophy (2009–13). These large-scale drawings of white lines expanding from a central point to a potentially infinite space are the result of a painstaking yet meditative process of mark-making and calculation. The rhythm of crossing triangles creates a surface tension punctured by moments of dazzling light where many points meet: points in the darkness that transform a rational minimalism into a universe–a universe containing the codes for all the other works. One and One describes the meeting point of two triangles, each having a side of equal length. There is a suggestion of endless points in repetition, a sense of everything being connected. Translating two dimensions into three, the Epistrophy works expand and contract in space like accordions, pulling us simultaneously inwards and outwards. The title of the series reflects the circularity within the structure of the cupola, which repeats inwards and outwards, giving the impression of an infinite circling with no beginning or end. Nasseri’s considerations of the importance of the gaze is most striking here, as the Epistrophy works occupy the eye-line so as to look back at you, while fracturing any possibility of looking at your mirrored self. A space is created that is both unlocatable and inaccessible, but to which we are physically bound as we search for ourselves in the fragments. The Glance works (2011–13) extend this relation of the gaze and interiority; smaller and less dizzying, their looking back at us has an uncanny feeling, with what is reflected being so near yet ungraspable. The duality of reflections, the here and there of this space and another, continues in Parsec (2008–10), which performs another inversion: what could be the solid form of the void now sits at our feet, becoming a somehow invisible space. As Nasseri describes it, “you don’t see the object, you see only the reflections.”v What is within—the core—eludes us. Looking back at Middle Eastern visual history is to look back at the story of art’s marriage with science and the mystical. Mathematics is not only understood as the building blocks of our—real—world, but is also a means of mapping the unmappable, continuing on where language ceases to communicate. It is always night, or we wouldn't need light (2014) attempts a mathematical mapping of incomprehensibly larger space, using marquetry of stainless steel inlaid in rich wooden panels. Here Nasseri connects to storytelling, with each work describing the celestial order at specific moments in time that are described in the accompanying texts, such as the constellation over the Campo de' Fiori in Rome the morning that mathematician and philosopher Giordano Bruno was burned there. The imaginative expanse of these works is made more poignant considering the propositions made by these thinkers, Bruno being the first to suggest the infinite nature of the universe, and Galileo that the earth revolves around the sun—moments of huge intellectual expansion. Though dialoguing with textual description, the hypnotic movements of circling geometry, physically inlaid with immaculate precision into deep organic surfaces, take off where the words end. Just as Borges’ short story describes the failure to comprehend a written language, there is always something lost in translation, gaps that appear in the process of notation, yet mathematics underpins everything as both the most universal and incomprehensible descriptor. In many of his stories, Borges uses mathematical theories to reveal deep abstractions, composing chaos and repetition, while also giving us glimpses of circularity and infinity that are far beyond our field of vision. In Drill Core (2012–13) Nasseri suggests a literal slice of deep structure, a fragment cut from the ether as we would cut from the earth, revealing a network potentially infinite yet again beyond our sight. The linear structures have an appearance of random dispersions, an inversion of the ordered geometry of other works which creates a variant spatial tension, the two playing off each other. The importance of points and lines is equally expressed in I saw a Broken Labyrinth (2012–current), the title being a reference to another Borges story, “The Aleph.” This description is itself a glimpse, one of the myriad visions described by the writer on seeing the Aleph—the point of revelation where “he sees it all.”vi Though Nasseri reduces this point to one of scant abstraction, still, in the elegance of lines converging; harmonic, expansive chords, he evokes spatial tensions: light and compressions which play from two-dimensional drawings across and within the other works, describing their own cosmos. The line itself is a definition of infinity, either as made up of infinite points, or the line that begins and extends without ending. Nasseri’s keen curiosity for mathematics may have originated from his relationship with Islamic geometries, but it has also been heavily influenced by Western mathematicians. 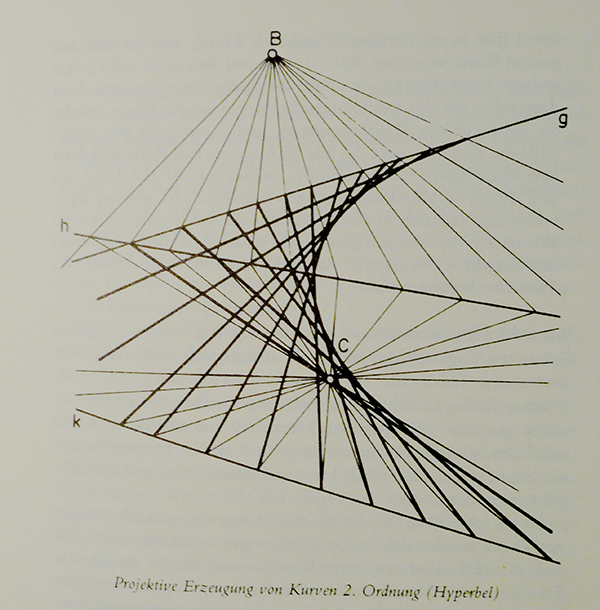 Looking at the work of 19th-century Swiss geometer, Jacob Steiner, who was concerned with the fundamental properties of the plane, line, and point,vii Nasseri, in the Mesh works (2012), re-describes these fundamental forms by translating their dimensionality. The three-dimensional versions become notations, and thus through interpretation reveal the transformation undergone by a system when a dimension is added or subtracted, resulting in something entirely new. Stepping back again to take in the works collectively, the emergent qualities of individual works begin to harmonize and bounce off each other. There are so many inversions, parallel thematics, and dualities here which are impossible to fully unpack; we flicker between East and West, inner and outer worlds, micro and macro… all reverberating between translations and retranslations, being turned inside out, upside down, shape-shifting from one dimension to another. But to try to disentangle this would be to miss the point—for, despite our curiosity, the failure to comprehend or to get to a core is the place in which we ultimately find ourselves. Thinking of the Western influence, the currents of ideas that flow through Nasseri’s thinking find their predecessors in the experimental attitude of the Sixties Avant-Garde, captured as it was by a fascination with Eastern mysticism, improvisation, and psychic exploration. In this time of interdisciplinarity, artists of all genres were exploring crossovers between art forms, and making connections to deeper structures and spirituality. Theories such as “Nada Brahma” were popular: the idea that we are made up of sound vibrations that are also the building blocks of the universe.ix This spiritual approach to sound led the jazz musician John Coltrane to think of harmonies, rhythms, and improvisation as resonant with universal properties. It is interesting to note that Nasseri came very close to becoming a musician himself, and to studying the saxophone, being deeply influenced by jazz and experimental music. Just as the Batin and Zahir of Islamic art describes the surface and its hidden core, so jazz pulls on polarities: of seeming improvisation and endlessness, which in fact contain deep mathematical structures. Relating jazz to mathematics, Coltrane became absorbed in Indian music and the relationships revealed by its structures and rhythms. Perhaps directly influenced by this, no doubt by his parallel interest in quantum physics, he drew a “tone circle”: a geometric representation of the relationships of musical pitch intervals which he gave to fellow jazz musician Yusef Lateef in 1967. The diagram is essentially a mandala, connecting five musical notes in patterns which become a five-pointed star. Fifty years on, theories connecting physics, mathematics, and sound remain as compelling as they were in the heady decade of spiritual seeking. In his 2016 book The Jazz of Physics: The Secret Link Between Music and the Structure of the Universe,x the physicist Stephon Alexander examines the connections between Coltrane’s exploration of the structure of jazz, and Einstein’s theory of quantum mechanics. His argument centers on the idea that both are built on mathematic logic with improvisation and intuition, to reach parallel philosophical spaces: the idea of expansion as fundamental state. According to Alexander, quantum particles move in a way akin to improvisation, traversing all possible paths in the way that jazz musicians play with all possible notes on a scale.xi Furthermore, Alexander discovered that the same geometric principle that motivated Einstein’s gravitational theory is reflected in Coltrane’s diagram. It is the same tetrahedron which forms the basis of Nasseri’s three-dimensional works—also “expansions” of two-dimensional geometries which have emerged from his own improvisation and intuition. Inward visions appear before closed eyes. Thousands and thousands of flashing microscopic points, sparkling diamonds, fulgurations for microbes. He goes on to describe “an infinite number of loops and twirls […] lacework upon lacework […] an infinity of ornaments.” Thinking upon Islamic art he then connects these visions to acoustic descriptions of the “curve of the vibrations of a chord”.xiv The fluidity and infinite variation of these inward visions is not only reflected in Nasseri’s improvisational drawings and the “flashing microscopic points, sparkling diamonds” which light up the One and One works; these visions articulate a larger connectivity that runs through Nasseri’s practice. Michaux reveals the synaesthetic correlations between mathematical forms, sounds, and space, bringing us back to a circular infinity, merging dimensions, inside and outside. Connecting vision and sound also brings to mind the experimental filmmaking of the era, which, following the works of Oscar Fishinger, crossed over abstractions in moving images and music.xv It makes perfect sense, therefore, that Nasseri would expand his vocabulary, liberating the archive of drawings and creating a film work where forms appear, merge, and disappear in various sequences and changing formations. In Extensions (2017) he has paired the visual library with a “pulsar symphony”: music that he has collaged simply from sounds of planets and pulsars, overlaid and repeated. The result is hypnotic and uncanny, a tick-tock of time and distance with no beginning and no end. Drawing all these works together is as simple as it is complex, and for everything that can be articulated, there is more that must be experienced through our physical presence with the work, and its slow unfolding. The constant back and forth between the body and the imagination has its own rhythms: we move from reading the drawings of Oh Time Thy Pyramids, where the disorientation happens conceptually in the imagination, to looking into mirrored geometries which have a visceral effect—they physically destabilise us, playing with our eyes and our ability to spatially locate ourselves. There is also the matter of sheer beauty, a term that strikes fear into many contemporary artists, but that is yet another area in which Nasseri holds his own ground. The aesthetic richness, the sense of sublimity in his work cannot be dismissed as a veil or a sole objective. It is part of an endeavor: intelligent, complex, and engaged with real things in the world. Nasseri is neither scared of visual excitement, nor of creating meaning—which is arguably a position contemporary art is crying out for. Perhaps we can consider Timo Nasseri’s artistic practice to be like Einstein’s Gedankenexperiments: a synthesis of reason, imagination, and intuition, which brings us closer to the edges of what we know and the incalculable spaces beyond… In mathematics we find beauty; in incomprehension we find the sublime. Jorge Luis Borges, “A Dream,” trans. Susanne Jill Levine, The New Yorker, July 6, 2009. Conversation with Timo Nasseri in his studio, June 16, 2017. Hans Belting, Florence and Bagdad: Renaissance Art and Arab Science, Harvard University Press, 2011. Conversation with Timo Nasseri in his studio, June 26, 2017. Jorges Luis Borges, “The Aleph” (1949), The Aleph and Other Stories 1933–1969, Penguin Classics, reprint edition (2004). Viktor Blåsjö , “Jakob Steiner’s Systematische Entwickelung: The Culmination of Classical Geometry,” Mathematical Intelligencer, 2009. Joachim-Ernst Berendt, The World Is Sound: Nada Brahma: Music and the Landscape of Consciousness, paperback 1991. Stephon Alexander, The Jazz of Physics: The Secret Link Between Music and the Structure of the Universe, Basic Books, 1st edition, 2016. Stephon Alexander, “The Physics of Jazz,” TED talk, published June 26, 2012. Henri Michaux, Infinite Turbulence, trans. Michael Fineburg, Calder and Boyes, London, 1975. Filmmakers such as Harry Smith, Jordan Belson, and Mary Ellen Bute, to name a few.